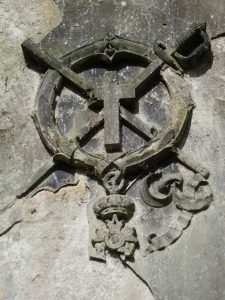 It is not generally known that there is a veteran of Napoleon’s Grande Armée buried in the Glasgow Necropolis in Scotland. This was François Foucart (1793-1862), who settled in Glasgow after the end of the Napoleonic Wars as a celebrated fencing master and teacher of gymnastics. Foucart had served as an officer in Napoleon’s Imperial Guard, and was a veteran of the Russian campaign of 1812. At some point he was appointed a Knight of the Légion d’Honneur, which is represented by a finely carved replica of the medal on the front of the monument which stands over his grave in the Necropolis. Little is known about his early life or his years in the army, or why he should have settled in Glasgow, but it is certain from his success there that his decision to move to Scotland was an entirely happy and prosperous one. He was born in Valenciennes, Department du Nord, France, in 1793 (although his gravestone erroneously gives his year of birth as 1781). He was the son of Louis Foucart, a former military officer and brewer, and his wife, Celestine Flamand. Details about military service in Napoleon’s Grande Armée are scant and it is unfortunate that he left no written account of this with which to verify when he enlisted or the regiment he was first attached to. It seems, however, that he followed his older brother Noel (1791-1862) into the infantry and rose to the rank of Lieutenant. He was most probably the Foucart mentioned in the memoirs of Sergeant Adrien Bourgogne, in which he is identified as the Barrack-Master who was taken prisoner in Russia. It is also probable that he is the Foucart listed amongst the wounded officers of the Regiments D’Infanterie Leger in Martinien’s Tableaux, par Corp et par Batailles, des Officiers Tués et Blessé pendant Les Guerres de L’Empire (1805-1815), in which he is recorded as being wounded at the Battle of Raab on 14 June 1809, when he was a Sub-Lieutenant, and also at the defence of Astorga, on 11 July 1812, by which time he had been promoted to Lieutenant. The other details which have been recorded, and which form part of his family tradition (i.e. that are as close to a personal memoir that we have from him), are confirmed in an account given by his son, Dr Louis Foucart, which was published in The Sydney Morning Herald in Australia, when Louis was promoting the founding of a gymnasium in the city in May 1861. He stated that his father ‘had been engaged in all the great engagements which took place from the siege of Burgos down to Waterloo, and in the course of his campaigning had received seventeen wounds’. He also pointed out that his early physical training had stood him in great stead for his old age; so much so that by 1861, when he was in his 80s (actually his 70s), he ‘could still vault over a 5ft (1.5m) bar, and walk a day’s journey with any man of sixty in New South Wales’. ‘[t]he necessity of cultivating muscular powers became so evident in France after the close of the great war in 1816, that Louis XVIII, Charles X, and Louis Philippe had all of them maintained the gymnasium as one of the most useful institutions in the country. Under the supervision of Marshal Soult, a gymnasium had been erected in which 10,000 troops could be daily exercised… and there was also another for civilians in the Champs-Élysées, at which there were no-less than twenty four professors employed’. It is not clear whether François Foucart was directly involved in the setting up or in teaching at any of these gymnasiums. However, it is evident that he was determined to export this French revolution in physical fitness overseas, and to establish his own gymnasium and fencing academy in the lands of his former foes in the United Kingdom. He appears to have arrived in Britain around 1818, after becoming a Professor of Fencing at the Royal Academy of Paris when his military career ended in 1815. 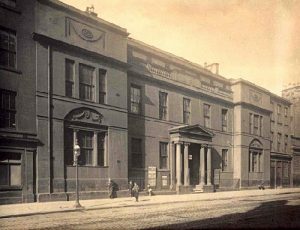 He settled first in London, and then briefly in Ireland, before finally settling down in Glasgow around 1823-4, when he founded ‘The Glasgow Fencing, Gymnasium and Orthopaedia Institution’. He is listed in the Glasgow Post Office Directory as a fencing master for the first time in 1825. He later became a Professor of Fencing and Gymnastics at the Andersonian University (now University of Strathclyde) at 178 George Street, where he rented a large room in the university’s Old Grammar School building (on the site of the present Royal College). This was near the birthplaces of two of his Peninsular War adversaries: Sir Colin Campbell and Sir John Moore, both of whom are commemorated with bronze statues which stand in George Square, close to the site of Foucart’s gymnasium. Foucart is mentioned in the university’s Minute Book covering the period 1832-39, in which the matters concerning him were of a relatively trivial nature, such as arranging to have his gymnasium whitewashed, the amount of rent he was required to pay for the room (£18 per annum, or £15 if he couldn’t quite afford the higher sum) and the number of pupils attending his classes in fencing and gymnastics. By 1837 they numbered 58 young men and women from the best families in Glasgow and the surrounding districts. He appears for the last time in the university’s records in February 1839, by which time he was involved in establishing a new fencing academy and gymnasium in the recently built Victoria Baths Building at 106 West Nile Street. This was a time when sword fencing was a much more popular sport than it is today, and when swordsmanship was regarded as an art to be taught as part of a young gentleman’s education. Foucart was particularly successful in popularising this branch of the martial arts and regularly held public demonstrations of his own and his pupils’ swordsmanship to great acclaim in the town’s Assembly Rooms in Ingram Street. These ‘assaults’ (as they are called) always attracted ‘brilliant assemblages’ of fashionable society eager to be thrilled and entertained by Foucart’s skill with the rapier and sabre, and they were rarely disappointed by the spectacles he mounted. For the winner of his pupils’ bouts, a light sword donated by Foucart would be their prize. The press, too, were delighted by his displays, which became a highlight of the sporting calendar of both Glasgow and Edinburgh, and they reported enthusiastically on the events and the excitement they generated. The assault held for the anniversary meeting of Foucart’s pupils on 18 April 1829 was, according to The Glasgow Herald, ‘one of the finest ever witnessed’. In Edinburgh he participated in the annual assaults presented by Monsieur George Roland, another French émigré who established the finest fencing academy in the capital. In February 1830, Foucart and Roland’s duels mesmerised their audience, with Foucart being reported as giving ‘more reason than ever to admire his irresistible impetuosity’. Foucart’s popularity amongst the higher echelons of Scottish society is best exemplified by his participation in the famous Eglinton Tournament of 1839. A spectacular recreation of medieval pageantry and jousting which involved the crème of Scottish knightly nobility as participants and spectators, as well as thousands of onlookers from the general public. Foucart would have been required to don medieval attire and give his best performance in the displays of swordsmanship that were intended to enthral his audience and remind them of the chivalric glories of ages long past. Memories of Foucart’s own more recent martial past in the service of Napoleon and his Imperial Guard would have been sharpened by the presence at the tournament of Prince Louis Napoleon, the future Emperor Napoleon III, and Jean-Gilbert-Victor Fialin, later Duke of Presigny, the prince’s most ardent supporter in the cause of Bonapartist restoration in France. One can only imagine the content and excitement of their conversation (if they did actually meet) about the Napoleonic era in which Foucart had distinguished himself in action and suffered numerous wounds to become a Knight of the Légion d’Honneur in the reign of the prince’s legendary uncle, Napoleon I. It does not seem, however, if the future emperor recalled Foucart’s entitlement to the St Helena Medal, which was awarded by him to Napoleon’s former veterans in 1852. His name does not appear in the existing records of the medal’s recipients, and Foucart never made reference to it himself, but it was an honour that he was entitled to without question. Foucart must have been quite a character in his day and he was certainly popular amongst his students and the public alike. Amongst his students were the poet William Motherwell and the dramatist James Sheridan Knowles, who modelled the hero of his Monsieur de l’ Épée on him in 1838 (both writers are also buried in the Necropolis). It is also claimed that he was the inspiration for the hero of Alexandre Dumas’ romance Le Maître d’Armes in 1840, although it is known that this was actually Dumas’ own fencing teacher, Augustin Grisier. Foucart’s life in Scotland was by all accounts indeed happy and prosperous, and he was blessed with a long marriage and loving family. He and his Belgian-born wife, Lambertine Levelly (1791-1877), were married in London, in the church of St John the Evangelist, Westminster, on 26 July 1818. They had at least four children: Louis, who was born in France during a brief return to Foucart’s homeland in 1820; Virginie, and Milenie, both of whom were born in Ireland; and Auguste, who was born in Glasgow in 1833, and who followed his father’s profession as a fencing master. The family lived at various addresses in central Glasgow. As early as 1826, the Foucarts lived in a ‘Cottage Style’ house on the east side of Portland Street, which had a garden extending to 373 yards around it. The house and land were put up for sale and advertised as ‘admirably adapted for building’ in the ‘Subjects To Be Sold’ section of The Glasgow Herald for 1 May 1826. The house and garden has long since vanished, presumably having been redeveloped soon after they were sold. 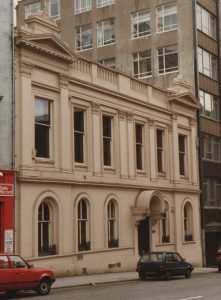 The Foucarts had by then moved to 239 George Street, where they lived throughout the 1830s. They later moved to 5 St Vincent Place, staying there for a decade from 1842. At this time the family home also doubled as a doctor’s surgery, which was run by Foucart’s son, Louis, who had recently graduated in medicine and surgery at Glasgow University. The census returns for the street in 1851 reveal that they were well enough off to employ a live-in house servant, Sarah Stewart. After Louis left home to practice in London, the family finally settled down at Falkland Place, 4 St George’s Road, in 1853. François Foucart died at his home on 26 June 1862, at Falkland Place, 4 St George’s Road, Glasgow, of acute bronchitis, which he had suffered for about a month. 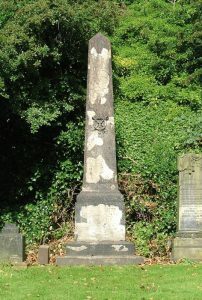 He was buried in the Glasgow Necropolis at 2pm on 1 July, in lair 60 of the cemetery’s Upsilon section, which was purchased for £16, the funeral being undertaken by Wyllie & Lochead. ‘Talk you of scars? – That Frenchman bears a crown! Was honor’s soldier, that ne’er changes sides. To teach his gallant art, and earn a home. This was not, however, the end of Foucart’s enterprise in promoting health and fitness, or the fame garnered to his family’s name. His son, Auguste, later left the city to set up gymnasiums in Liverpool and Sydney, Australia, where his brother, Louis, had set up as a doctor. Louis, having already established his medical credentials in Scotland, later moved to London, where he became indelibly linked to the life and death of one of Britain’s greatest Prime Ministers, Sir Robert Peel. His association with him was brief, however, but of the utmost importance and renown, as it was Louis who happened to be close by when Peel was thrown from his horse and very badly injured on the evening of 29 June 1850. He attended to Sir Robert until he died in the evening of 2 July. Later, Dr Louis Foucart moved to Sydney, Australia, where he became the Government Medical Officer of Health and Quarantine Officer at Port Jackson (Sydney Harbour). He lived in Rozelle, and owned land in the appropriately named nearby district of Waterloo. He eventually retired to England, where he died at Lucan House in Ripon, Yorkshire, on 25 March 1899. Back in Australia, it was Louis who was responsible for notices of his father’s death appearing in Australian newspapers in 1862, such as The Sydney Morning Herald and The Argus in Melbourne. This meant that François Foucart became as well known in the Southern Hemisphere as he was in Scotland at the time of his death. 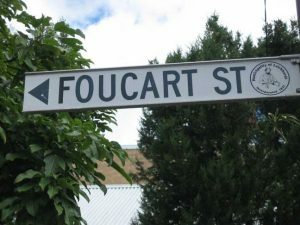 There is even a Foucart Street and Foucart Lane in Sydney. Although these were named after Louis, they also continue the association with his father and the great era of Napoleon and his Knight who rests thousands of miles away in the Glasgow Necropolis. Baptism Record, François Foucart, Valenciennes, St Jean, 11 August 1793. Cottin, Paul (ed.) Memoirs of Seargent Bourgogne 1812-1813, New York, 1899. Martinien, A., Tableaux, par Corp et par Batailles, des Officiers Tués et Blessé pendant Les Guerres de L’Empire (1805-1817), p. 441. Sydney Morning Herald: Sydney Gymnasium, Thursday, 6 May 1861, p. 5. Mitchell Library, Glasgow Post Office Directory, 1825-1867. Strathclyde University Archives, SUA: OB/1/1/4, Andersonian University Minute Book 1830-1894, pp.41-222. The Glasgow Herald: Fencing and Gymnastics, 28 September 1827. pp. 11. Scotland’s People Death Print, RD: 644-06, Register of Death (François Foucart), No. 263, p. 88. Mitchell Library, TMH32/5/2: Glasgow Necropolis Internment Notice Book, 1 July 1862. Mitchell Library: Glasgow Necropolis Burial Register, 1859-1897, Microfilm, Spool 2. Scotland’s People, Wills and Testaments, SC3, Confirmations, 216-217 and 610-612. Black, James, The Glasgow Graveyard Guide, Edinburgh, 1992, Necropolis, No. 12, p. 45. Sydney Morning Herald: Family Notices, Saturday, 23 August 1862, p. 1. The Argus (Melbourne, Victoria): Deaths, Thursday, 4 September 1862, p. 4.